Product prices and availability are accurate as of 2019-04-13 12:54:34 EDT and are subject to change. Any price and availability information displayed on http://www.amazon.com/ at the time of purchase will apply to the purchase of this product. 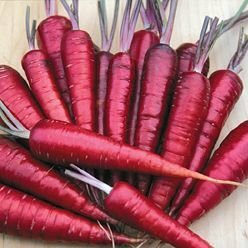 Absolutely unique, purple-skinned carrots with deep orange flesh. They look amazing in salads or as a steamed vegetable. Roots have a high antioxidant and vitamin content, so are best eaten raw and are perfect for making carrot juice.